This weekend saw me spending lots of family time, and not much space for the hobby. Not bad though as I did get something done anyway. 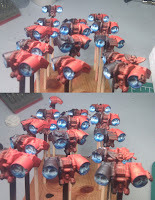 I have been wondering what to do with my Jump Packs to give them the used/in use look and in Googling may ideas, I decided on a Jump Pack glow effect. Eggroll on Dakka has a perfect glow on his army, that finally made me take the leap. First I was paranoid about overspray so I taped off my red side with low tac painters tape in strips. Second I set up my colors. 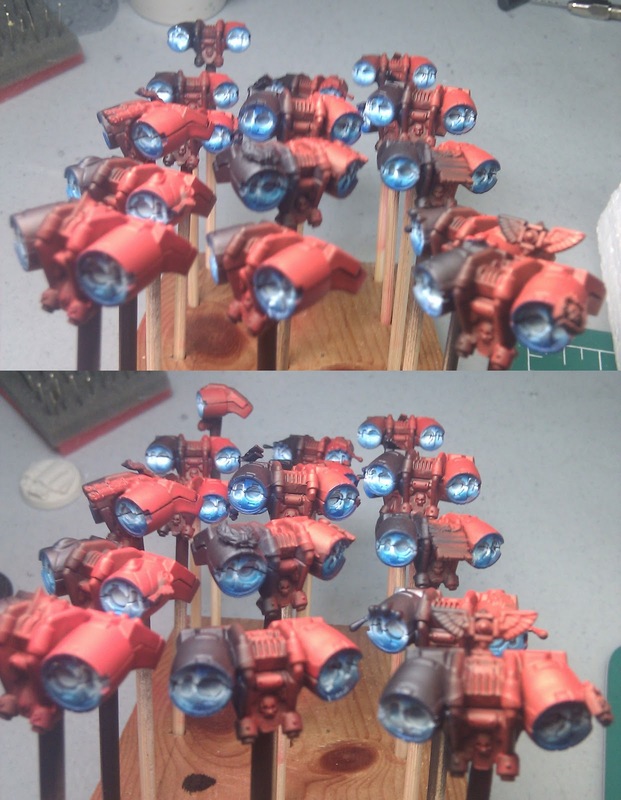 I took Regal Blue, Icy Blue, and White, thinned them for the airbrush and did my first test piece. 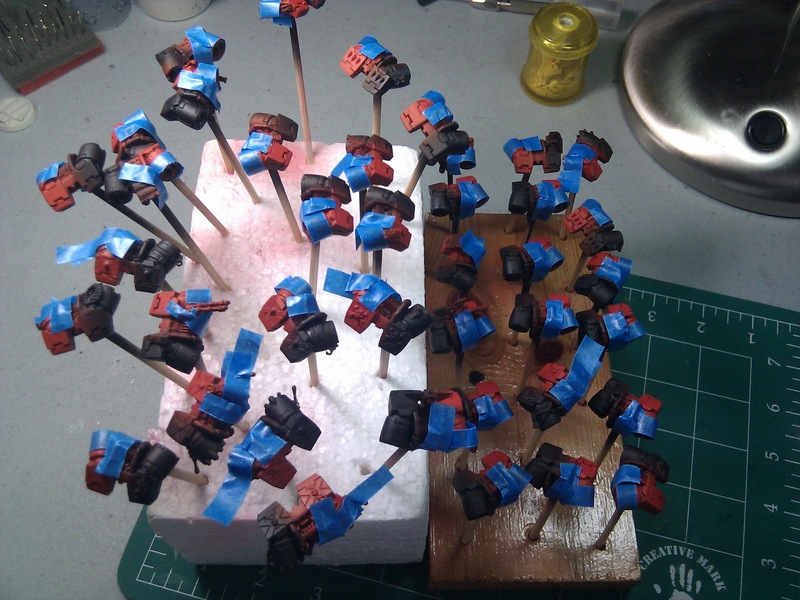 At a tabletop view they create the desired effect, similar to the Plasma coils, so I decided to go for it and painted up the remaining 39 jump packs in assembly lime fashion. Great for tabletop, and I feel its a good contrast from the red. 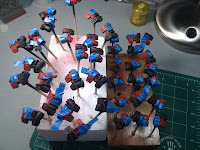 Painting up 40 jump packs in progressively smaller area shades of blues and whites, was actually pretty fast. The practice helped improve my trigger control and by the end of it I felt pretty confident that I could have done the same work without the tape masking at all. With practice I was able to achieve just with the right level of control. Overall, I find the results look pretty good and give the packs an in flight / just landed look. I find myself looking more and more at a model and thinking where I can apply the airbrush, especially to create gradients and blends. The next big airbrush hurdle will be the vehicles. It's a bit intimidating but I feel better after this bout of practice. Next step is the cleanup of the black armor. Yeah I know, I was supposed to do that this time but I decided to do the blue first, as it might need cleanup anyway. Thanks for the look-see and the vote of confidence. It makes me happy to know that diverse hobbyists like you take the time to check my work out!